Feeling stressed out? Finding it hard to juggle work with your personal life? Meditation can help! In fact, tons of research shows that meditation can help alleviate stress, anxiety, and depression. And while meditation might seem daunting to a newbie, it doesn't have to be -- here's your guide to meditation for beginners. Meditation is a word that's thrown around a lot. But sometimes it can be challenging to describe the practice of meditation to a beginner. In essence, meditation is the practice of focusing your mind on a single point of reference. Some meditation exercises instruct you to focus your attention on your breath or other bodily sensations and others encourage you to focus on a mantra. 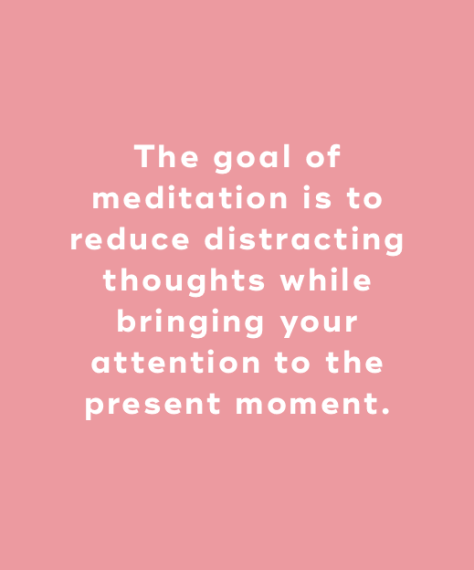 The goal of meditation is to reduce distracting thoughts while bringing your attention to the present moment. Yes, meditation can sound intimidating. But the good news is there is no right way to meditate. Meditation is a process, and you will become better at quieting down distracting thoughts over time. Some days your brain might feel too distracted to meditate, but on other days, you might feel calmer, and as a result, you'll be able to meditate more easily. There exist several different types of meditation techniques, and no two are the exact same. 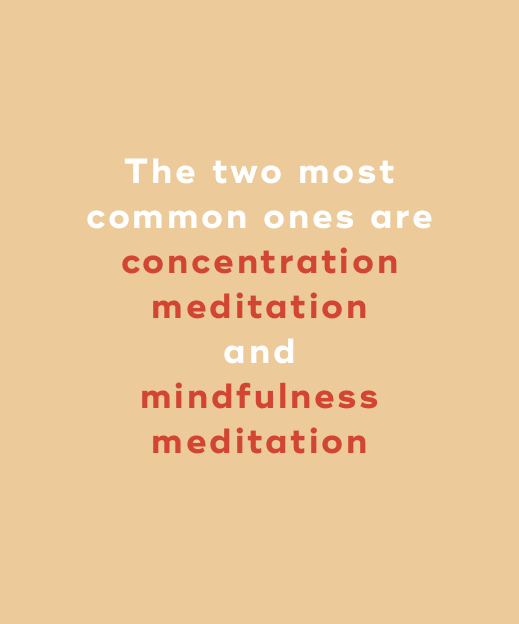 The two most common ones are concentration meditation and mindfulness meditation. Concentration meditation involves focusing on a single point. You can decide to focus your attention on your breath, an object, or a single word. Each time your mind wanders, you simply refocus your attention. Through this process, you learn to let go of random thoughts. Beginner meditators usually just focus their attention for a few minutes at first and then work their way up to longer durations. Mindfulness meditation encourages you to observe thoughts as they drift through your mind. The goal is to not analyze the thoughts or judge them but to just be aware of them. Mindfulness meditation teaches you to recognize patterns of thoughts over time. To begin this exercise, sit in a chair. Begin focusing on an aspect of your breathing, such as your stomach rising and falling as you inhale and exhale. Once you've narrowed your focus, then start broadening it. Pay attention to sounds, sensations, and ideas. Consider each thought without judgment, and allow it to pass. If your mind begins to race too much, start focusing on your stomach again. Then expand your awareness again. To start this exercise, light a candle and sit in a chair. Dim the lights. Then focus your attention solely on the candle flame. Each time thoughts pop into your mind, redirect your attention to the flame. After concentrating on the candle flame for a while, close your eyes and try to imagine the candle flame in your mind. These two meditation exercises will help to improve your concentration and creativity while reducing stress and negative thinking. 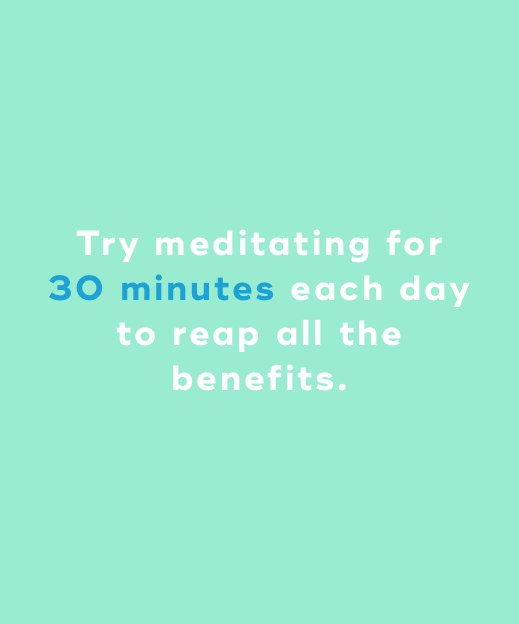 Try meditating for 30 minutes each day to reap all the benefits. Meditation doesn't have to be difficult. And it offers tons of mental and physical health benefits. Give meditation a try by doing a few beginner meditation exercises. As you progress, focusing your mind will become easier. Remember there is no right way to meditate. "Meditation: A Simple, Fast Way to Reduce Stress," Mayo Clinic, n.d.
"Meditation Health Benefits: What the Practice Does to Your Body," Huffington Post, December 6, 2017. "The 'Right' Way to Meditate," Psychology Today, July 4, 2016. "Two Mindfulness Meditation Exercises to Try," Harvard Health Publishing, January 2016.